David Blaine is a brilliantly clever American illusionist and endurance artist who is known for his amazing street and close-up magic tricks. 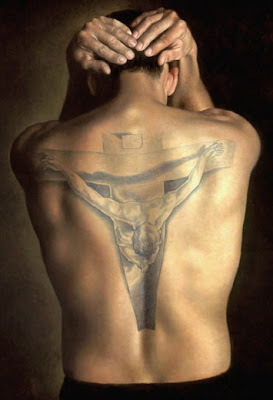 David Blaine has several tattoo designs on his body, including a large crucifixion scene which covers most of his back, the design is a recreation of Salvador Dalí's famous "Christ of Saint John of the Cross" artwork. The tattoos on his left arm include, a large marshmallow shaped design with a face, along side a tiger. On his right arm is a pair of eyes and eyebrows, plus some fake tribal designs seen in the picture below. His other tattoos include, a cherub angel on the left side of his chest, plus a male figure holding a walking stick while scratching his chin, located on the right side of his abdomen, and finally the numbers 174517 on his forearm, which represents the numbers given to Primo Levi at the Auschwitz concentration camp in Poland.